Friday, August 27, 2010 at 9 a.m. to Sunday, August 29, 2010 at 6:00 p.m. The Upper Miramichi Regional High School in Boiestown will be closing its doors at the end of June 2010. The Doaktown Primary School will also be shutting down in late fall/early winter. As of September 2010, Doaktown Consolidated High will be removing its Grades 6-12 students so they can join as one with those from UMRHS to form the new Central New Brunswick Academy. 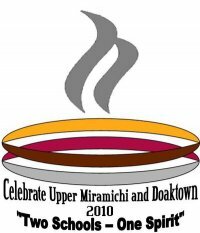 A joint-committee of residents from the Rural Community of Upper Miramichi and from the Village of Doaktown is planning a gala reunion to honor our former schools and to celebrate a new beginning. The “Two Schools One Spirit” event scheduled for August 27 – August 29, 2010 will feature a Meet & Greet, tours of the schools (new and old), an ecumenical church service and songfest, “The Last Dance” prom, and much, much more. An invitation to attend is extended to all former students, teachers, custodians, bus drivers, parents and anyone else who wants to join us in paying tribute to these educational facilities that have been such focal points in our communities for so many years. Book your summer vacation to include Friday, August 27 to Sunday, August 29, 2010 and please help us spread the word. Thanks so much, Kellie. Your support of events in our area is greatly appreciated by posting updates of such on Bread’n’Molasses. Wonderful!